A market exists whenever buyers and sellers exchange goods and services. 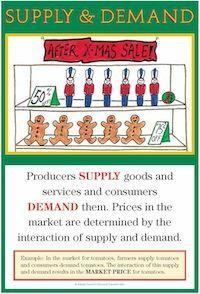 Buyers (consumers) demand goods and services; sellers (producers) supply them. The interaction of buyers and sellers determines market prices. (The market price is also known as the market clearing price or the equilibrium price.) At the market price, the amount consumers want to buy equals the amount producers want to sell. Prices send signals and provide important incentives to both consumers and producers. At higher prices, consumers have an incentive to purchase less, while producers have an incentive to produce more. At lower prices, consumers purchase more, but producers have an incentive to produce less. Market prices fluctuate as supply and demand change. If other things do not change, an increase in supplyor a decrease in demandcauses prices to fall. A decrease in supplyor an increase in demandcauses prices to rise. Draw people buying and selling different kinds of goods and services in various settings. Label the pictures, identifying people as either Producers (Supply) or Consumers (Demand). Give examples of markets in which buyers (demand) and sellers (supply) meet face-to-face and other markets in which buyers and sellers never meet. b. When the price goes down, buyers will purchase more and sellers will produce less. Make two cards for each student. On one, show an upward pointing "increase" arrow; on the other, show a downward-pointing "decrease" arrow. Create and read simple supply and demand scenarios. At the same time ask each student to hold up the correct card. Examples: "It is a very hot day. What will happen to the demand for your lemonade?" (Increase.) "In this situation, what could happen to the price you charge for the lemonade?" (Increase, because demand went up.) Have students create their own scenarios. Discuss sales. Examine newspapers for sales, including "going-out-of-business sales." Why do stores have sales? Do sales typically reflect an increase or decrease in demand for a good? Discuss the advantages and disadvantages of waiting for an item to go on sale.